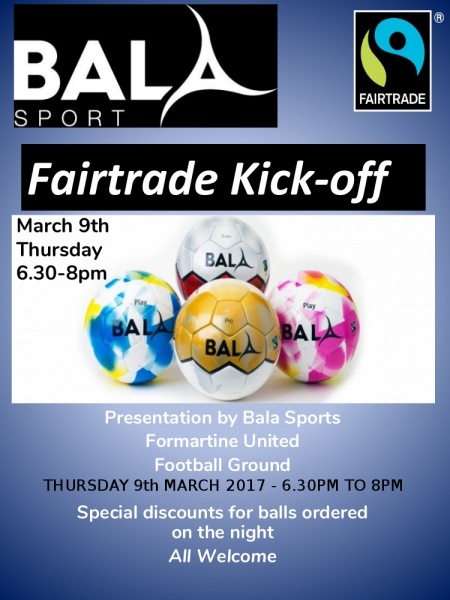 THE BEAUTIFUL GAME OR THE SHAME – FAIRTRADE IN SPORTS – KICK OFF EVENT 9th MARCH 2017 AT FORMARTINE UTD. Aberdeenshire should be the leader on ethics in our schools says local Fairtrade spokesman Paul Johnston. “Part of education is about respecting rights and respect for our environment. Much of this is exemplified in Schools involvement in issues such as Fairtrade. “When people learnt about the conditions that child labour was used to stitch footballs for international competitions as well as the balls used in UK games, there was an outcry. Rightly so. The international convention on the rights of the child does not permit forced child labour. “We can hear about the beautiful game and the real story behind the footballs – and what will put it right. Fairtrade footballs, certification prevents balls being made by exploiting children. The Fairtrade system is creating a fairer world.